The Chikita Mya is designed to go anywhere! The size makes it perfect to take to a friend's house, social gathering, or on your next trip. Made of durable metal and glass this portable Hookah is perfect for the Hookah smoker on the go. 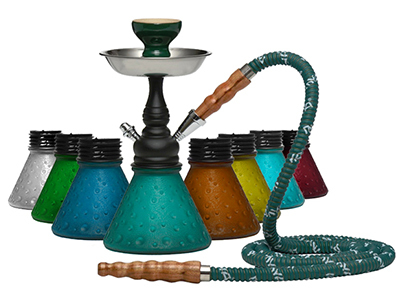 The Chikita Mya may be converted to a two hose Hookah by utilizing stem adapters that contain the auto-seal system. The Auto Seal system eliminates the need to use rubber stoppers and flip caps when there are multiple users smoking the Hookah. This Hookah may be used for both decorative and smoking pleasures, providing entertainment for years to come.